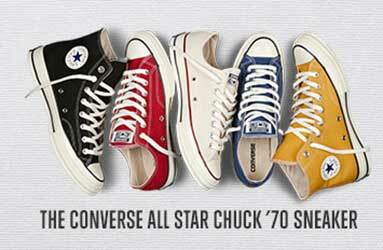 The first five models of the Chuck ‘70 line. In January of 2014, Converse released the Chuck ‘70 series of Chuck Taylor All Star athletic shoes, a line based on the manufacturing standards for chucks in the 1970s. This wasn’t the first time that this had been done. In 2008, the Japanese Converse Company issued an optical white high top based on vintage standards, but this is the first time that a line of chucks based on vintage standards has been produced for the US market. The Chuck ‘70 line includes the classic black high top and a mustard yellow high top, along with red, parchment white, and navy blue low cut oxfords. I’m not quite sure where the decision to make a mustard yellow high top came from; it never was a very popular color back in the 1970s. The optical white, blue, red or green high tops were a lot more popular. The parchment low cut is similar to the unbleached (natural) canvas core models still sold today. The shoes are made in Viet Nam. The exciting news about this new line of chucks is the restoration of many of the features that were taken out of the shoes starting in the late 1980s for the purpose of cutting costs. 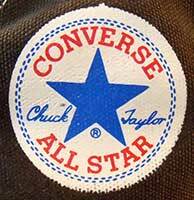 Back then the Converse management started marketing canvas Chuck Taylor All Stars as a leisure and fashion shoe for the counterculture, rather than as an athletic shoe for basketball, other sports, or a leisure shoe for regular folks. Bad financial and product line decisions caused the company to lose market share. Management back then lost their focus and forgot that chucks, their number one product, were meant for all kinds of activities and sports, and all facets of mainstream society, not just for the counterculture, young people, or rock stars. 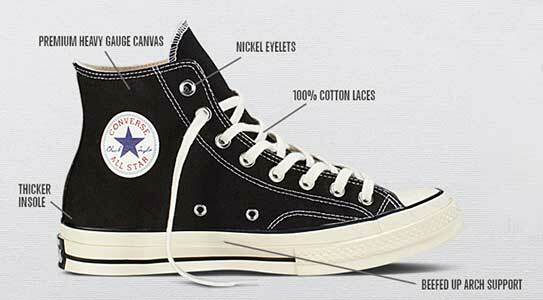 Chucks are America’s classic sneaker, and belong to all generations and lifestyles. 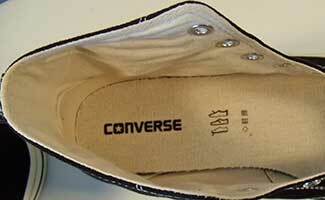 Eventually the bad management of the Converse Company in the 1990s led to their bankruptcy at the turn of the century. Luckily devoted fans all over the world continued to want to purchase and wear chucks, and helped the great recovery of Converse and restoration of its market share in the world of athletic shoes and sneakers after the bankruptcy. Now chucks are more popular than ever, and are worn by people of all ages throughout the world. The issue of this line of chucks, restoring some of their important features and excellence that only the older generation would remember, allows younger generations of chucks enthusiasts to share that experience. You do pay for this extra quality, however. The high top models are priced at $85 and the low cut oxfords at $80 a pair. Some of the restored features shown on a Chuck ’70 high top. The difference in the canvas is the first thing you notice. The uppers can stand up on their own and you can feel the difference when you lace up a pair. One of the hallmarks of vintage chucks was the high quality duck canvas uppers. It is nice to see that restored along with the extra piece of canvas on the insides of the shoes. You can observe this in the outer stitching, which now has a paired arch of threads between the eyelets and the upper stitching. Inside you can see that additional piece of canvas, which provides extra support for your feet. When you wear the shoes, you can feel the comfort of the thicker insole and greater arch support. Probably the best thing about the Chuck 70 is the return to all rubber outer soles, instead of the composite materials that have been used since manufacture went over to Asia. You notice the difference when you walk or run in a pair. With these outer soles, you really feel like you are wearing a vintage pair of chucks. 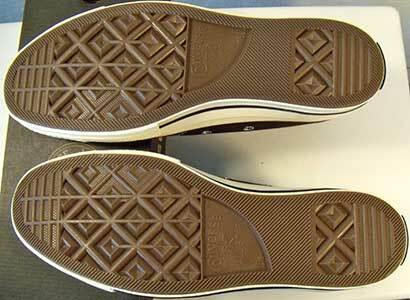 You can even get a whiff of that rubber smell that used to be one of the cool features of a new pair of chucks back then. The outer soles of the Chuck ’70 black high top. Another difference between these shoes and the standard chucks sold today is in the toecaps. 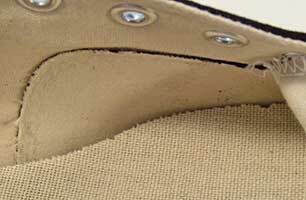 The black piping that defines the toecap is inset more. This is because the outer foxing is about a half inch taller, again like it used to be. The natural line of the piping is separated from the diamond patterned toe guard by a full half inch as opposed to the one-eighth inch in today’s standard models. The piping remains thinner, which looks fine. Some models back then had thicker piping, double the width used today. Toecap on the black Chuck ’70 high top. The foxing has also been slightly varnished, making the color more off white in appearance. You can see the contrast between the foxing and the white laces in the photo. Speaking of shoelaces, again these are a disappointment. They are described as all cotton, but they are narrower than the standard laces classic laces issued with chucks in the seventies. The laces included are tubular, but only one quarter inch wide. The tube is thick and doesn’t have the give you would like. The shoelaces issued in the seventies were thinner but wider, and had more spring in them. And even more irritating is Converse’s continuing practice of outfitting their chucks with shoelaces that are way too long. The pair shown in these photos came with laces that were 64 inches long, instead of 54 inches, which is all you need for an eight eyelet pair. With the higher quality canvas which cinches up a little more over the tongues of the shoes, a 54 inch pair of shoelaces laced on this pair still had nearly nine inches on each end to tie a knot, after lacing up through the eight pairs of eyelets. What are you going to do with an additional five inches on each end? I guess you have to wind the excess around your ankles which looks silly. Or you have super wide bows on the knots, which you could trip over. Whoever approves issuing these extra long shoelaces should actually lace up a pair or two and wear them for a while. A second significant miss in detail is on the back spines of the shoes. The classic core models all use matching color for the spine stitching, black in this case, not white. Thank goodness Converse has continued to keep the core models looking the way they always did, so why make a throwback model, which is costing a lot more money than a standard model, that didn’t observe that design standard? I suppose you could take a black permanent marking pen and fix that, but the use of white thread really is a manufacturing mistake since they no longer match the look of core chucks from the rear, like they should. One other detail is in the ankle patch. Back in the seventies, the ankle patches had brighter red lettering and a bright blue star. These ankle patches have dark red and blue colors. The ankle patch on a 1970s issue black high top. One other nice touch from the past is the inclusion of the players name inside the tongue of the right shoe. This reminds you that chucks were once the premiere basketball shoe, and when you finally got a pair, you wanted to be sure not to lose them. For that matter, there is no reason you can’t play serious basketball in these chucks. Hundreds of athletes did back in the seventies and many other decades. 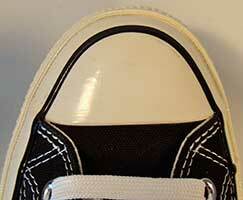 Inside the right tongue of a Converse ’70 high top. Despite these minor flaws, Converse is making a step in the right direction with the Converse ’70 line of Chuck Taylor All Stars. It seems that most everyone wears sneakers now and chucks are the classic American sneaker. It’s about time that they got restored to their full glory. Now if they would only manufacture them in the USA again (sigh)! 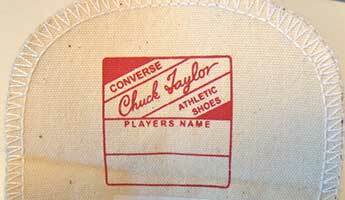 Click here to see a photo gallery of Chuck '70 Black High Tops. Hal Peterson is the author of Chucks! The Phenomenon of Converse Chuck Taylor All Stars.